Yay I'm getting super excited to finish my 1st quilt, I added the sashing and borders last night after lots of folding and stacking trying to decide on colour options. I recently bought some MORE fabric (I know, I know) because I just didn't have the 'right' one for the rest of my quilt, of course! I used a pink checked fabric, part of the 30's playtime collection by Moda, to offset the blue and red colours I have used throughout. Oh my gosh!!! It's perfect!!! Really, really fantastic!!! This is so cute!!! I love it :) It has a perfect vintage quilty lovely feel to it! Really lovely. The colour combinations and patterns are gorge. 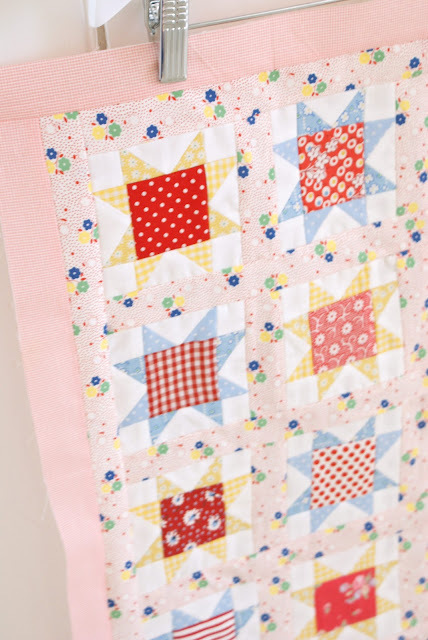 You make me want to give quilting a go! Oh I *adore* your quilt. So precious!! Wow that looks really good for a 1st. I haven't even made a proper quilt yet. Still waiting for my wadding/batting to arrive. when i saw your quilt top, i said 'oh my goodness!' OUT loud!! it's really cute!!! You've done a great job! 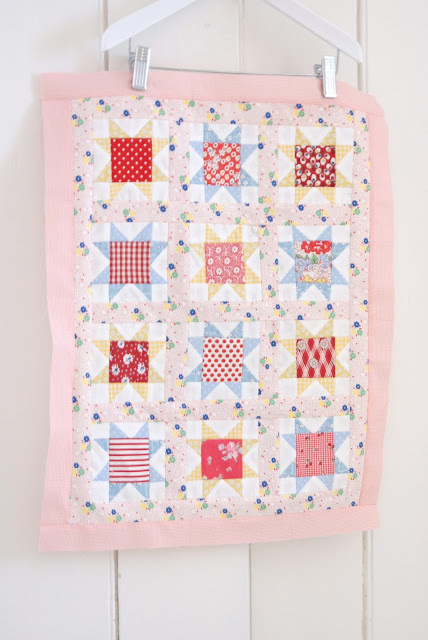 This is a special little quilt--one you will look back on with very fond memories. It may not seem like it now, but this is a landmark in your quilting journey. Can't wait to see where it all leads! That is so beautiful. You did a great job, and I love the color combo. Congratulations on your first quilt top done! Oh it's so beautiful! I really love that you've used a floral patterned fabric in-between the blocks - that looks fab and really adds another dimension. Gorgeous!! After seeing that lovely top I have no doubt the rest of it will go together beautifully!! Love it! Wonderful fabrics. It looks very delicated.